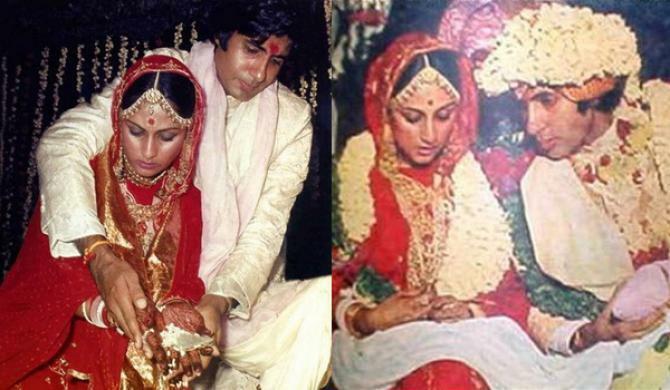 Lets take a look at the most stunning Bollywood brides of all time. Jaya Bachchan nee Bhaduri, looked every bit charming, coy and ravishing in a red bridal saree, complete with traditional Indian wedding jewellery. 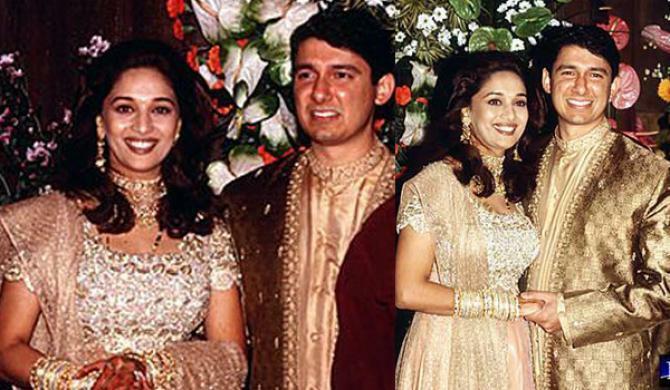 Madhuri Dixit and Dr Sriram Nene got married in a hush-hush ceremony, but we have their wedding reception photographs here for you. Madhuri, looked stunning in golden ethnic wear, with elaborate and intricate work on it. She matched it with a net dupatta. This minimal look, combined with matching gold jewellery, made the diva look like a million bucks. What stood out in her look were those beautiful bangles that adorned her wrists. Kajol and Ajay Devgn tied the knot in a typical Maharashtrian ceremony, and Kajol looked every bit traditional in a green saree. Her look was complete with traditional bridal jewellery of the region, along with a nath, green chooda, and vaaki (armlet). 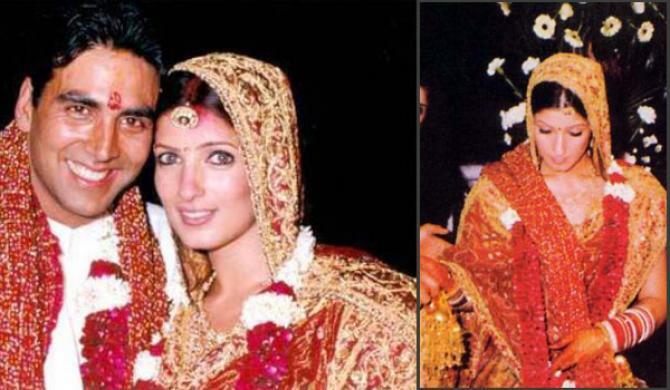 Elder daughter of superstar Rajesh Khanna and Dimple Kapadia got married to casanova Akshay Kumar, in 2001. 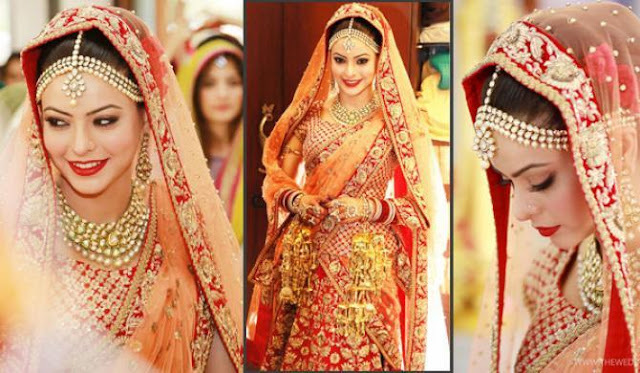 The actress stuck to a bride's favourite colours- red and gold. She kept her bridal avatar minimal with simple jewellery, and just a statement maang teeka stole the limelight! 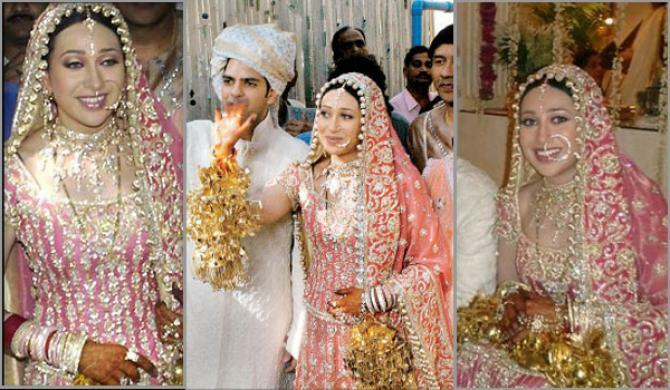 Karisma's bridal look gets a thumbs-up for her choice of colour for her outfit. The pink bridal wear definitely made her stand out from most of her contemporary brides who might or might not have made it to our list. Though the ever-so-fair Karisma looked heavily decked up in the intricately embroidered lehenga choli, matching jewellery, traditional chooda and kalire, she carried it off so effortlessly and beautifully. Aishwarya wore a traditional, golden yellow Kanjeevaram saree on her D-day, complete with Swarovski crystals and gold thread work. The bridal saree was designed by Neeta Lulla. She kept her hair braided and covered with flowers. She wore 22 karat gold jewellery, which included a gold and emerald armband. We know that we are jumping a little way too ahead, but the Kapoor sisters deserve to be mentioned together. 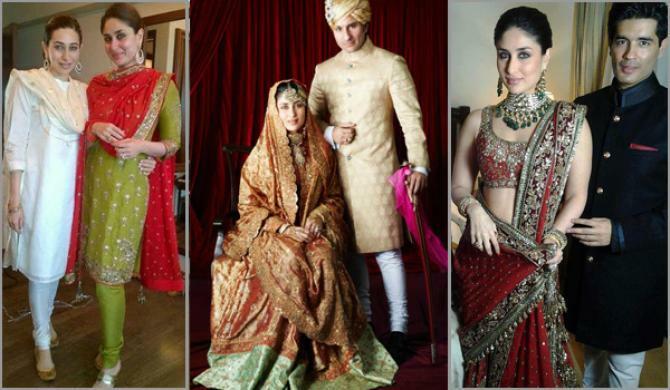 Unlike her elder sister, Bebo had a number of wardrobe changes on her wedding day. In the morning of the wedding registration, Kareena opted for a comfortable green churidar kurta and a contrasting red dupatta. In the evening, she wore her mother-in-law, Sharmila Tagore's wedding gharara, which was restored by Ritu Kumar. For the reception, she slipped into a burgundy lehenga with a maroon dupatta designed by Manish Malhotra. Kareena wore heavy gold and Kundan jewellery on both the occasions that took place in the evening. 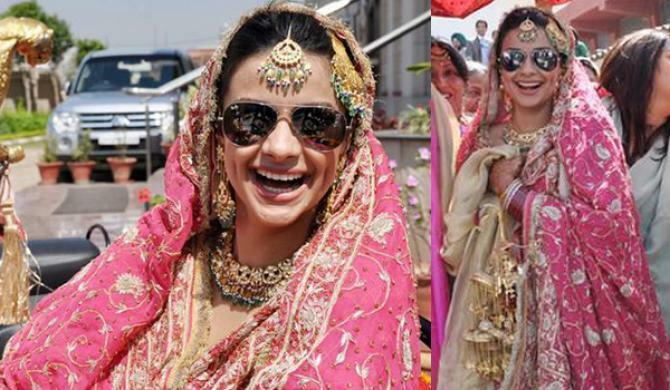 Gul Panag had a traditional Sikh wedding ceremony in a Gurudwara, in Chandigarh. She opted for an onion pink lehenga for her D-day, which was designed by JJ Valaya. Her bridal look was complete with a heavy gold neckpiece, earrings and maang teeka, studded with contrasting green stones. And, she even added cool glares to comfort her eyes during the daytime wedding. She looked like a truly cool bride, we say! The much-in-love couple, Genelia and Riteish Deshmukh, tied the knot on February 3, 2012. For the Maharashtrian wedding, Genelia wore a bridal saree, designed by the Bollywood brides' favourite designer, Neeta Lulla. The saree had a gold Kundan border. Traditional Maharashtrian jewellery completed Genelia's wedding day look. 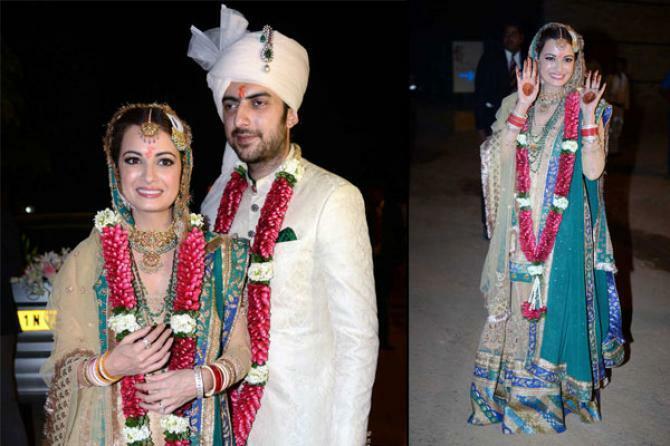 Dia Mirza, the former Miss Asia Pacific tied the knot with her filmmaker husband, Sahil Sangha on October 18, 2014. What we loved about her look was that she chose to stay away from the traditional red on her wedding day and instead, chose green. She looked absolutely stunning in the sharara designed by Ritu Kumar, which was paired with a long golden jacket. Aamna looked as stunning as ever when she donned a bridal look that simply left her fans (and, we are sure, her fiancé too!) floored. With a stunning colour combination of red, orange and gold in her lehenga choli, Aamna opted for traditional gold bridal jewellery. And, with chooda and kalire, she looked like a true Punjabi bride. Anushka Sharma and Virat Kohli stunned everyone when they took the wedding vows secretly in Italy in December 2017. The actress looked ravishing in her real-life wedding avatar. 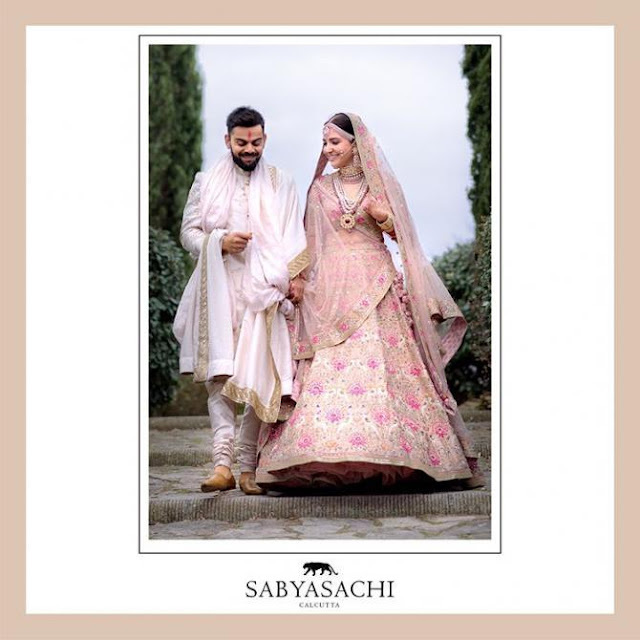 Anushka chose to wear a pale pink-coloured Sabyasachi lehenga that had renaissance embroidery on it. She completed her look with uncut diamond and spinel choker, earrings and matha patti by Sabyasachi only. Dimpled beauty and one of the bubbly actresses from Bollywood, Preity Zinta walked down the aisle with Gene Goodenough in an intimate ceremony in Los Angeles on March 1, 2016. Theirs was a hush-hush wedding ceremony with only family members and a few friends in the presence. 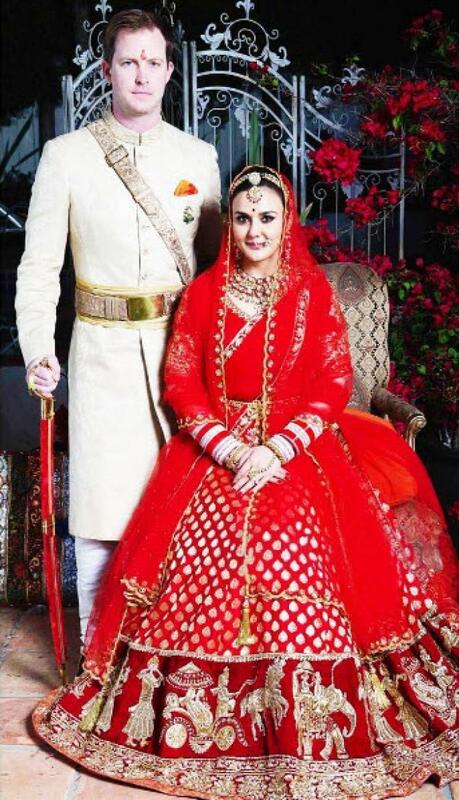 Preity wore a bright red lehenga with traditional embroidery in gold. Her wedding lehenga was designed by her favourite Manish Malhotra. She chose to wear jadau jewellery to complete her look. 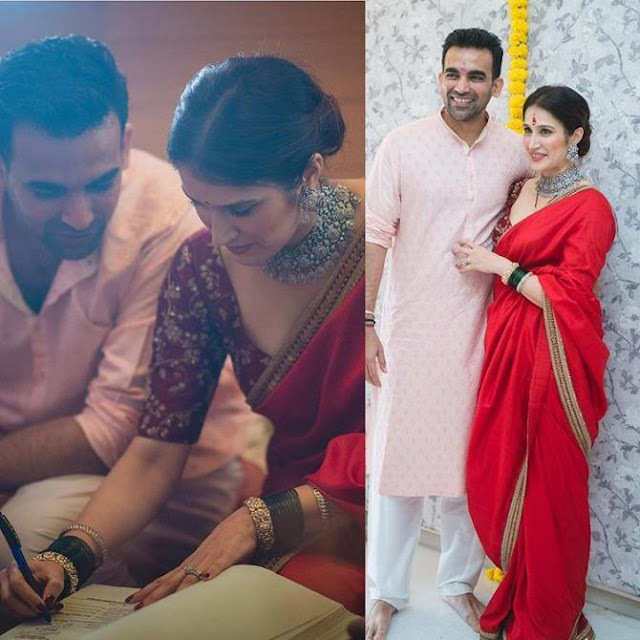 Famous Bollywood actress Sagarika Ghatge, shattered many hearts when she tied the knot with cricketer Zaheer Khan on November 23, 2017. It was a registered marriage for the lovebirds, which was then followed by grand celebrations. 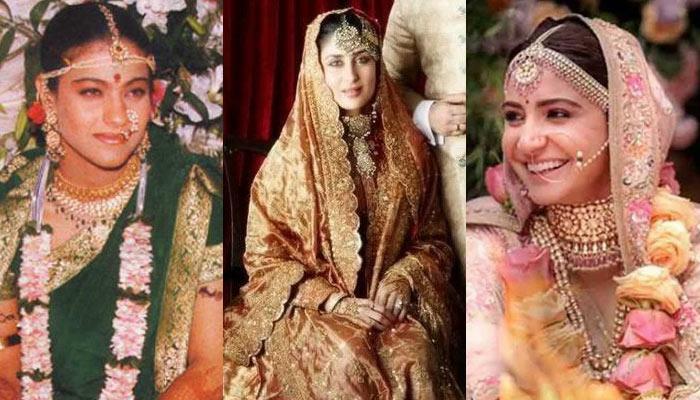 On her wedding day, which was a court one, Sagarika chose to redefine “Less is more” look. The actress looked stunning in a stunning silky drape in red colour. The actress adorned herself in a red Sabyasachi saree that had a rich golden border brought a cultural approach to her dressing sense. She completed her look with exquisite silver jewellery, mangalsutra and the green glass bangles.